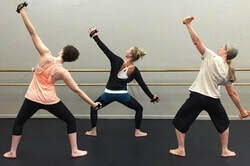 Registration for most classes (except Ballet I A & I B, HD Fit and My Buddy & Me) closed December 1, 2018. You can view an explanation of our dance program in the ﻿﻿CLASS INFO﻿﻿, view a ﻿﻿LIST OF CLASSES﻿﻿ we offer, or view the WEEKLY SCHEDULE. Classes run September 10, 2018 through June 8, 2019. ​ Begins Saturday, April 13, 2019. ​ Begins March 11, 2019.